It's Not Just A Haircut! - It's More l How Much Is A Good Haircut Worth? What is the worth of a good haircut? It is worth having many great hair days. A great haircut can put a bounce in your step and give your attitude some sass. Salons and salon professionals charge varying prices for hair cutting services. However, when you think of restaurants……so do they. What makes a service be more or less really is dependent on varying factors. The old adage of “you get what you pay for”…. does hold true most often. Does it mean that if you pay a very cheap price for a haircut that it will not be good…….I am not to say, but what I can assure you when you choose my business is that I have professionally invested my time and money into education. I get very agitated when someone refers to a haircut as “Just a haircut”. I professionally, strongly disagree. Strong hair cutting skills require the knowledge of angles, analyzing face shapes and knowing various cutting techniques. My client wanted to change up her short haircut, but she did not want long hair. 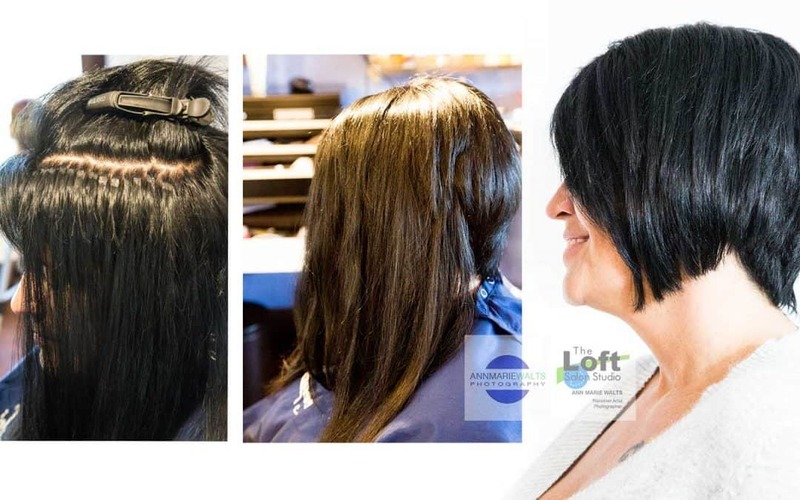 Previously, she had a very poor experience with hair extensions, and had thought that she would never try them again, but changed her mind during our consultation. She was excited to be able to add some length to her sides, and to be able to lengthen her bang area. I could never imagine not having hair extensions as an option to offer my clients. I really covey to clients to think of hair extensions as a fun accessory or like “extra fabric”. The time is would take to grow a section of your hair out or all of it……..literally could be years. Who has time for that? On the topic of accessories, how many pairs of shoes or dresses do you have in your closet? Have you added up how much money that you may have spent on them? Maybe you do not want to, but my point is this…….. Those fun items are not worn everyday like you do your hair. Get a bad one………and it will cost you not feeling good about yourself. Get a bad one……and you may need to call a hair extensionist to fix it.